Reprocessed one of my old photos. 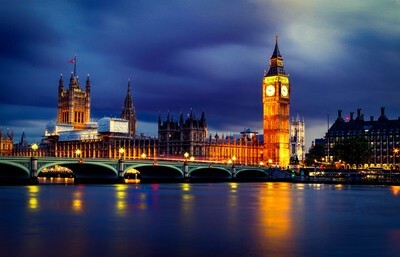 This photo was captured in London and shows the Big Ben and River Thames; two of London's most iconic attractions. The photo was captured in the late evening soon after sunset. At this time, there was enough light left to illuminate the sky; but still dark enough to allow the capturing of a long exposure. The lighting was natural. As mentioned, the time after sunset was ideal for this photo so that the sky could retain a good amount of color and light while still being dark enough for a slow shutter speed to soften the river. For this photo, I used Pentax K50 with smc DA 18-55mm lens. No flash was used. I happened to be in London for a pleasure trip. Unfortunately, I didn't have my tripod/filters with me. All I had was my secondary camera and its kit lens; but that wasn't going to discourage me from trying my best. Soon after sunset, I found myself in an area close to Westminster and I decided to stick around to capture the Big Ben in its full glory. I particularly wanted to capture the Big Ben and the Thames in a long exposure to blur the water. When the lighting was ideal, I set up my camera. Having no tripod, I created a tilted platform on the parapet by placing my camera on my phone that was supported by my finger underneath. Once the camera was stabilized, I captured this long exposure and was pleased with the result. Minor post processing was done to improve the details in the buildings. Further softening was added to the surface of the river. Contrast and saturation were fine tuned to an optimal level. I normally carry Pentax K3 with Sigma 18-35mm f/1.8 lens. My secondary cameras include Pentax K50 and Nikon P510. Other lenses I own include smc DA 18-55 mm WR and smc DA 50mm f/1.8 I also own a number of continuous video LED flashlights from the Chinese brand NEEWER (which I find more useful for photos rather than videos); and two flashlights, one from Pentax and one from Yongnou; which I use indoors with umbrellas. The most important thing to consider is the time of the day! Cityscapes are best captured at sunset/late evening. The dramatic lighting makes the photo very impressive! A little later, the city lights also start appearing while there is still some color to the sky; that particular time is the best. The next most important thing to consider is the vantage point. A suitable vantage point is crucial. Be at a good enough height to capture the buildings at a good angle. Too high and too narrow an angle will not bring out the "3D" eye popping effect. Finally, post processing should be reasonable. I notice people overdoing it and ruining an otherwise great shot. Keep it real guys! Also, add some "structure" by selective sharpening of shadows and highlights; rather than applying sharpness to the image as a whole.